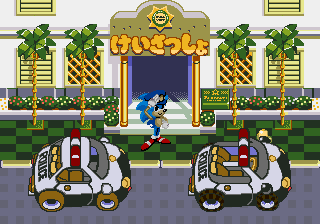 Recently, Waku Waku Sonic Patrol Car finally made its way onto MAME thanks to the work and funds of some pretty cool individuals. I ended the article with a little bit of a rib saying that SegaSonic Popcorn Shop should be the next game dumped. Now that one can be marked off the list because it too has now been dumped and should be hitting MAME. The main notable note is that this game also operates on MegaDrive-type hardware named the SEGA C2. It also curiously comes with an English switch, meaning there is a possibility the game came to the West in limited numbers, or at least was planned to. But this could make for a neat arcade board to setup at home for the more dedicated. 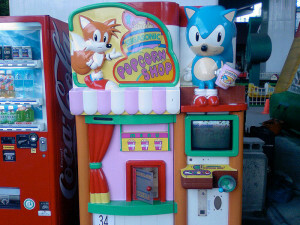 The story is pretty simple: Sonic and Tails want popcorn, Eggman wants to bludgeon Sonic with a hammer (because that’s his way of saying he wants some too or something), Eggman steals popcorn as it pops, Sonic blows up the machine and roasts Eggman, because he’s a jerk and doesn’t share. Enjoy those calories. So that now makes two of the rare three obscure arcade Sonic titles dumped and preserved on the Internet. That basically leaves the most obscure of them left: SegaSonic Cosmo Fighter Galaxy Patrol. Much like with Waku Sonic, I encourage those that want to or are interested in arcade game preservation to look into sending in donations to the dumpers (as it’s usually not cheap to do this) or join up communities that specialize in preservation. Full disclosure: I’m not taking any credit for this happening, but it does amuse me.